“As the author Jeremy Lent points out in a recent essay, it is almost certainly too late to save some of the world’s great living wonders, such as coral reefs and monarch butterflies. It might also be too late to prevent many of the world’s most vulnerable people from losing their homes. But, he argues, with every increment of global heating, with every rise in material resource consumption, we will have to accept still greater losses, many of which can still be prevented through radical transformation. “Our system – characterised by perpetual economic growth on a planet that is not growing – will inevitably implode. The only question is whether the transformation is planned or unplanned. Our task is to ensure it is planned, and fast. We need to conceive and build a new system based on the principle that every generation, everywhere has an equal right to enjoy natural wealth. Studies have shown that, once 3.5% of a population becomes sustainably committed to nonviolent mass movements for political change, they are invariably successful. That would translate into 11.5 million Americans on the street, or 875,000 Australians. Between 1900-2006, campaigns of nonviolent civil resistance were twice as successful as violent campaigns. In this TEDx talk, Erica Chenoweth talks about her research on the impressive historical record of civil resistance in the 20th century and discuss the promise of unarmed struggle in the 21st century. She focuses on the so-called “3.5% rule”—the notion that no government can withstand a challenge of 3.5% of its population without either accommodating the movement or (in extreme cases) disintegrating. In addition to explaining why nonviolent resistance has been so effective, she also shares some lessons learned about why it sometimes fails. We (co-authors and @sciencemagazine) encourage you to widely share the international letter in support of young climate protesters. “In 25 countries around the world, rebels of all kinds and backgrounds have begun taking non-violent direct action in a bid to save our planet from catastrophe. From today onwards we will be writing history. The London Rebellion has had a fantastic start. Under a bright blue morning sky, Earth Marchers, Rebel Riders and freshly arrived rebels from all over the country began packing up their tents – having camped overnight in Hyde Park. By 8:30, affinity groups were in position across the city; by the afternoon, five locations had been taken and held by an estimated 10,000 people. Creative teams sprang into action, creating a unique theme and feel for each location. Following an initially light response from police, tactics changed around evening and the force on Waterloo Bridge began making rolling arrests, with no sign of stopping. Brave rebels continue to stand their ground: at the time of writing (1:00am), Waterloo Bridge remains green. A massive thank you and well done to everyone and anyone involved in today’s actions. Have no doubt: together, we are changing the world. It’s been great to be back on Waterloo Bridge – and this time to stay! At a prompt 9 o’clock affinity groups moved onto the bridge with no trouble, quickly transporting tens upon tens of plants of all sizes. Flanked by their leafy brethren below on the South Bank, these green new visitors helped to transform the atmosphere of the bridge. Thousands of people have come to join us, from rugged rebels to curious commuters: joining in inductions, listening to music from the stage, or pulling some moves on the newly established skate ramp. UPDATE (1:00am): The rebels on the glass roofing have elected not to come down for twelve hours, forcing police into a protracted waiting game. During this time, the other three arrested earlier in the day have since been taken to police stations and released without charge, and have returned to find their two fellows still unarrested. Supportive rebels have thrown food and sleeping gear up to those on the roof – it looks like the police below have plenty of waiting still to do! The officers beneath probably weren’t expecting a 12-hour wait. The bridge’s atmosphere changed from jubilation to (joyful) determination at around 7:00, when police declared their intention to start making arrests. As night fell (7.30pm), Police issued a section 14 and began arresting people on the bridge – but for every rebel arrested another stepped forward. One of those present commented that there were a ‘huge number of people’ still on the bridge, and that they were hopeful to be able to hold the bridge for the night at least. At the time of writing (12:00am) there have been over 30 arrests, but the arrests have ceased. For now at least, the bridge holds. UPDATE: at 1:00am, police are massing on the South side of Waterloo Bridge: it looks like this is going to be an effort to clear the bridge. The rebels are tired, but ready. Several have glued themselves to the underside of the stage/van: this alone could take hours to clear, creating the (for now, still remote) possibility of early-morning relief from the other sites. Parliament square was taken over quite early in the morning, around 10.30am; at the peak there were around 2,000 rebels in the Square. The day featured many fantastic political speeches and conversations. At around 3pm rebels moved into the road and began blocking the roads around the Square while a funeral procession took place in the centre of the Square. The energy of the day was incredible, with theatre and singing contributing to the amazing atmosphere. By evening rebels were concentrating on holding the space and were still debating on the best approach to do so. A rebel on the ground commented that the speeches and conversation in Parliament Square epitomised the intellectual heart of the movement, that is, its wish to engage ordinary people in conversation about politics and democracy. Marble Arch today was host to a number of very successful actions and events – XR Families welcomed new rebels in the morning, with inductions and creation of new affinity groups all day, and in the late afternoon, the Chorus of voices, a spoken word performance with a core music group entitled ‘The Silence Ends’. A kitchen was set up and fed 100s of rebels throughout the day, while tents set up on the road and a large number of musicians lent the normally busy traffic junction a festival atmosphere. At night the Arch was illuminated with XR projections reading ‘Act Now’, ‘Time is running out’, ‘Extinction Rebellion’ and ominous reminders of the degrees of global warming to date and tons of CO2 emitted. This set the stage for an evening performance by Nick Mulvey, with an estimated 300 or so rebels still holding the Arch by 8.30pm. By late evening, the roads were quiet, and, with blocks set up, rebels were confident that they would be able to hold this iconic site for the night. With 1,000 rebels strong we took over the heart of London, Oxford Circus, and won over the hearts of many Londoners and some tourists. Jem Bendell, professor of sustainability, kicked off the day with an inspiring speech declaring our mother earth’s #MeToo moment. “We gather and rebel not with a vision of a fairy-tale future where we have fixed the climate, but because it is right to do what we can. To slow the change. To reduce the harm. To save what we can. To invite us back to sanity and love. The truth is we are scared and we are brave enough to say so.” The crowds responded with chanting and singing, while XR Youth painted the streets and played football. Oh and we also brought along our big, pink sound system boat of truth and danced the day away to reggae and dance music. XR Youth marched from Parliament Square to Piccadilly Circus, accompanied all by the way by an explosive samba band. Once in the Circus, young rebels scaled the central fountain and festooned it with our banners. At the same time, others were busy redecorating the entire road area with chalk-written messages. The message of one 9 year-old was: “save our future”. Disclaimer: those involved in writing these updates are excited but exhausted by the day’s events; we’re deeply, deeply appreciate of our fellow rebels around the world, and will do our best to cover their incredible, moving and inspiring exploits – but we can’t promise to catch everything! If you have a story that we’ve missed, please email us at xr-newsletter@protonmail.com with ‘Story’ in the subject line. In Brussels, rebels blocked the road and formed the XR logo in front of the European Parliament, demanding that they declare a Climate Emergency. Actions will continue throughout the week, with a visit from Greta planned on her tour through Europe. Rebels in sunny Sweden held a lie-in at Parliament, Riksdagen in Stockholm, and then blocked the bridge. Extinction Rebellion Ottawa blocking intersections and talking to drivers and passers-by, then moving on to a different intersection. Thanks for reading this International Rebellion Update. Our team will be sacrificing a lot of sleep and time on the streets in the coming days because we know that sharing information will be key to our success as a movement. We hope you agree! 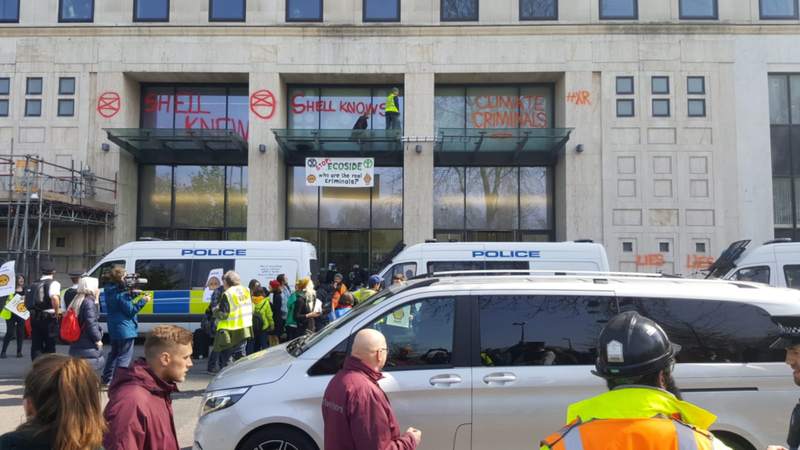 Interested in doing more with Extinction Rebellion?